As the temperature rises and the sun starts beating down in the spring and summer, the heat can take a toll on your vehicle – particularly the engine. Although engine overheating is not as common today with newer vehicles, under certain conditions even brand-new engines can overheat. The process of starting and running a car creates a lot of heat and strain on the engine. Factors like low coolant levels, damage to hoses or other engine components and leaks when combined with outside temperatures and being stuck at idle for long periods only make conditions worse on your engine. What does engine overheating do? If engine overheating is not addressed and the root(s) of the problem is not resolved the extreme heat can lead to serious and expensive problems. Cracked gaskets, warped cylinders and other engine component degradation are all common results of unaddressed engine overheating. Addressing and repairing the typical causes of engine overheating are far less expensive and painless than dealing with the results, so there really is no reason not to have them taken care of immediately. Luckily, vehicles are equipped with a temperature gauge and an alert system to notify you if your engine is experiencing extreme heat levels. What should you do if you are driving and your engine actually overheats? Follow these steps to in order to maximize your safety and minimize the damage to your car. 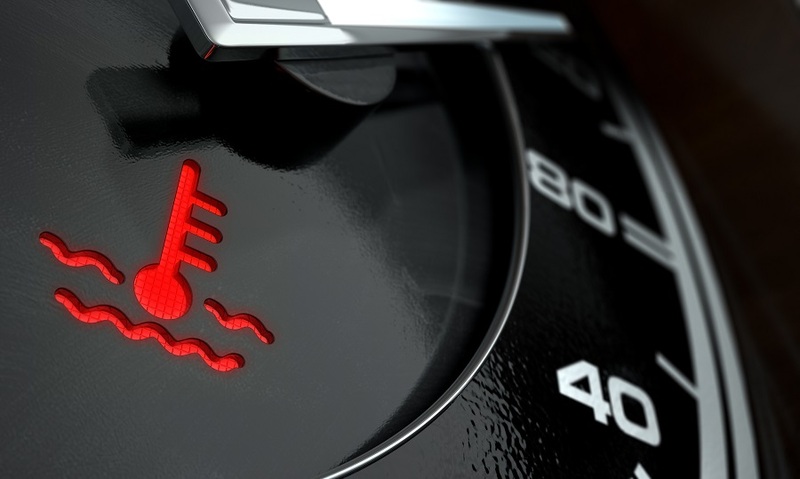 Whether you are driving down the road on a blazing hot summer day or you are stuck in rush hour traffic, if you get the alert that your engine is running hot you need to do whatever you can to get it cooled off as soon as possible. Turning off your air conditioner will limit some of the stress that may have contributed to overheating. As soon as you get the chance, pull over to a shady spot. Once you’ve found a safe and preferably shady place to park, turn your engine off to let it rest. Once it’s turned off it can begin to cool off and return to a stable temperature. Now that you are parked and the engine is off, you’ll want to give your engine time to cool down and normalize. Depending on conditions this can take a few minutes or up to an hour or so. Typically, you should allow at least 30 minutes of cool down time. If your temperature gauge reads that it has cooled off you should be safe to proceed to your destination. If the problem persists, you may have to call for a tow to prevent engine damage. Once you are home or at your destination, let your engine cool off completely before checking under the hood to see if you can find the problem. We can’t stress letting it cool down enough because it can get very hot under the hood and you could risk burning yourself. Once it has cooled, however, check to see if you can locate the cause of overheating. Start by checking your coolant level to see if you have sprung a leak or are low. If you are running dry, topping off your fluids may be an immediate fix. Also, check on the condition of the radiator hoses for any leaking that could have caused the overheating. If the solution to your problem is something simple like topping off your coolant, get it taken care of immediately. If it’s something more substantial like a leak, a damaged hose or something you can’t recognize yourself, take it in to be looked at by a professional. If you have an issue with a faulty hose or other issues causing your vehicle to overheat, bring it to Raben Tire for an evaluation and service!